A Real SRS Customer Story – A customer in the medical equipment industry came to SRS DE needing a tote washer to handle several hundred plastic totes per day. The totes needed to be cleaned to a medical standard. Due to the large size of these totes (22″ x 20″ x 18″) and the number of totes they needed to wash, a conventional washer would not work. 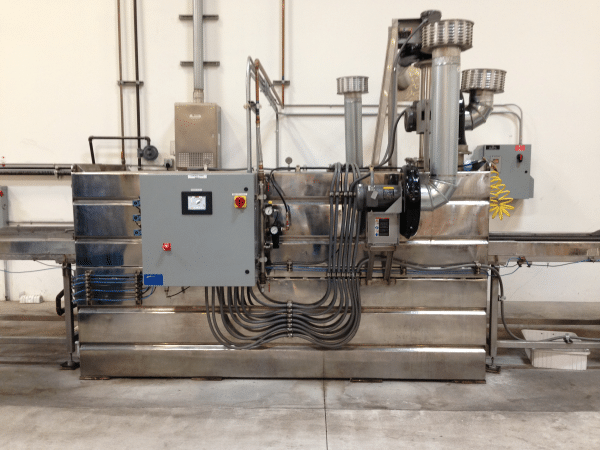 SRS designed a CTW-Series (CTW-50) conveyorized washer to efficiently meet the customer’s requirements to wash, rinse, sanitize and dry their totes. By using an automated conveyor, the totes advance into an enclosed wash chamber where they are cleaned, rinsed, and sanitized. After that, they are moved to the last part of the chamber where they are dried by air knives. The cleaned and dried totes then move on to the exit conveyor for removal and reuse. The CTW-50 Series can be entirely controlled or manipulated by the PLC via an 8” color touch screen (HMI). The unit is constructed of corrosion resistant stainless steel for an added life span. The CTW-50 has saved the medical equipment company with water costs by re-circulating the wash water, thus minimizing water consumption. The unit has also substantially cut time and labor costs.